The home of Short-track racing thrills in Northern California! Saturday races starting date TBD! Speedway motorcycle racing every Friday night, all summer long!! Many Tahoe City businesses stay open late on the first Friday of each month and offer refreshments, music, and specials. Emergency food and clothing closet serving the needy of the Foresthill Divide. This outreach is supported by the Christian churches, service organizations and individuals. We are open for food pick-ups and delivery on Wednesdays 10:30 a.m. to 12:30 p.m., Fridays from 1:30-3:30 p.m. and the third Thursday of the month from 8:00 to 10:00 a.m.
Every Tuesday Year 'Round from 8:00 a.m. to 1:00 p.m.
Roseville Parkway and Galleria Blvd. Come and browse the many thousands of enticing items for sale. Try our breakfast treats and tasty lunches which is a fundraiser for Sierra Vista Community Center.Let us know if you would like to volunteer in the kitchen we would love your help. The Salt Mine is a public charity, offering emergency services to the city of Lincoln and surrounding communities. Our main charitable activity is our food closet, presently offering emergency food to over one thousand needy families in the area each month. In addition, we help with emergency clothing, household items, and transportation. Other emergency needs are met on an ?as available basis? or by referral. Our food closet is funded by the generous donations of friends of The Salt Mine and through the proceeds from the sales at our two thrift stores in Lincoln (The Salt Seller, 454 F Street and The Salt Mine Thrift Shop, 103 Flocchini Circle). All items sold in our thrift shops are donated by local supporters. WWJD? Food closet at the Colfax United Method Church offers food, a hot meal, and clothing to those in need. This unique haven serves as a drop-in center seven days a week offering youth a safe place to hang out, share with LGBT and ally youth peers, play video games, watch TV, have snacks, do homework and interact with mentors in a living-room environment with a computer lab, WiFi, cell charging stations, video games and a television. For homeless youth, the Center also has shower and laundry facilities, toiletries and snacks to help these marginalized youth begin to feel human again. 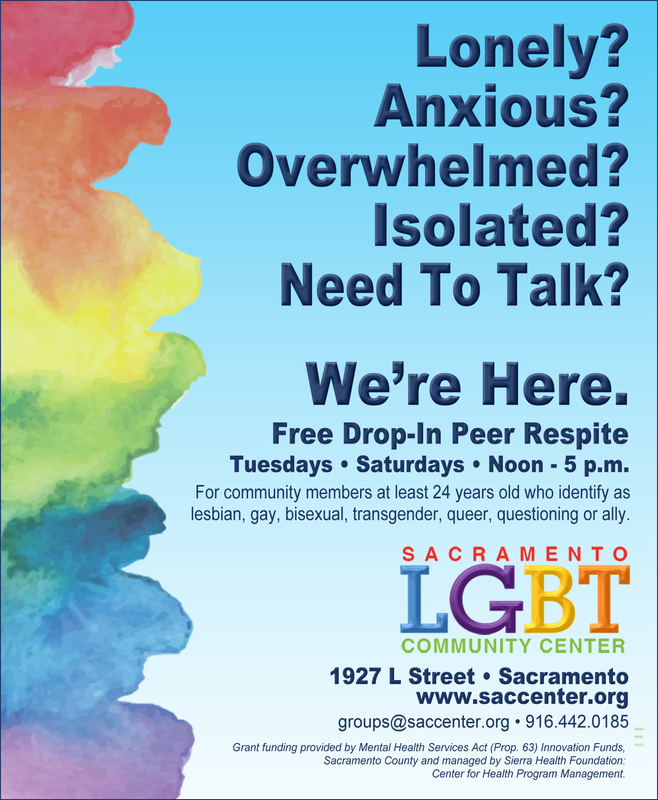 Drop-in hours are Mon. ? Fri., 3-6 p.m. and Sat. and Sun. from 11 a.m. ? 5 p.m.
A faith based organization offering a food and clothing closet. Please call or visit the church if your want to be involved in the church?s community outreach programs or need assistance. The Food and Clothing Ministry occurs every Thursday from 9am - Noon. Free triage medical care for people without insurance. Please enter the clinic from Coconut Alley, which runs between Main and Grant..Free triage medical care for people without insurance. Please enter the clinic from Coconut Alley, which runs between Main and Grant. The Community Health Clinic, a collaboration between The Gathering Inn, St. Vincent DePaul and Placer County Community Clinics, is staffed entirely by volunteers. Abundant Life Fellowship provides individuals in need with grocery and food items, cloths (adult and children), toiletries and sundry items. These items are provided on a temporary basis until situations can be changed. Hours are from 10 am to 12:30 pm on Wednesdays. Auburn Interfaith Food Closet serves individuals and families living in the communities of Auburn, Alta, Applegate, Bowman, Colfax, Dutch Flat, Foresthill, Gold Run, Clipper Gap, Iowa Hill, Loomis, Meadow Vista, Newcastle, Ophir, Penryn & Weimar To prove eligibility, clients need to have some form of photo I.D. with their address. Clients are allowed to visit the Food Closet once every 30 days. Each family is provided with approximately three days of food proportioned to the size of their family. Homeless receive help tailored to their needs. If cooking and/or refrigeration aren't available, we provide food that doesn't require cooking or cold storage. As best we can, we provide food that meets the USDA daily nutrition requirements and, if necessary, foods that do not require a can opener. When available, we also provide can openers. We provide personal care packets depending on need. Other pricing information: To qualify for food, individuals and families must live in the Auburn area (Alta to Loomis including Foresthill). Please bring a drivers license or identification card to receive food. Individuals and families are eligible to receive benefit once every 30 days..
Auburn Interfaith Food Closet serves individuals and families living in the communities of Auburn, Alta, Applegate, Bowman, Colfax, Dutch Flat, Foresthill, Gold Run, Clipper Gap, Iowa Hill, Loomis, Meadow Vista, Newcastle, Ophir, Penryn & Weimar To prove eligibility, clients need to have some form of photo I.D. with their address. Clients are allowed to visit the Food Closet once every 30 days. Each family is provided with approximately three days of food proportioned to the size of their family. Homeless receive help tailored to their needs. If cooking and/or refrigeration aren't available, we provide food that doesn't require cooking or cold storage. As best we can, we provide food that meets the USDA daily nutrition requirements and, if necessary, foods that do not require a can opener. When available, we also provide can openers. We provide personal care packets depending on need.Other pricing information: To qualify for food, individuals and families must live in the Auburn area (Alta to Loomis including Foresthill). Please bring a drivers license or identification card to receive food. Individuals and families are eligible to receive benefit once every 30 days. Seniors only. Please call to verify availability. Our family caregiver support group is not for the person with the diagnosis. If you need information regarding respite for your loved one so you are able to attend the support group, please feel free to contact the Alzheimer?s Association at 1-800-272-3900. Our family caregiver support groups are not for the person with the diagnosis. If you need information regarding respite for your loved one so you are able to attend the Support Group, please feel free to contact the Alzheimer's Association at 1-800-272-3900. Our programs vary week to week: educational speakers, live entertainers, local field trips, low vision information accessible technology, support group, beginning white cane travel skills, connections with other VI agencies, advocacy skills, low vision cooking, Braille reading/writing lessons, and low impact exercise programs. HOSPITAL STAY! ? WHAT ARE MY RIGHTS? Who will help you when you are taken to the hospital? Coming out of surgery, will you have decisions to make? or hospital admission? Safe discharge planning? Learn about the Vial of Life Program, Advanced Directives, and more. Free. Brought to you by CA Alliance for Retired Americans (CARA). Refreshments provided. Door drawing. RSVP to Diana at 916-300-8676. Join our Empowered Elder Workshop! Every Saturday, rain or shine!! All Aboard The Fountains Train! A writing workshop that explores writing and spoken word as a tool for healing and personal growth. This program is for teens and young adults. While free, space is limited. Join us for Knitting Group. The group is open to all knitters, crocheters, loom artists ... whatever your thread, you are welcome. This is a NOT a class, it's a group intended for individuals who enjoy the company of other yarn artists. Bring your project or start a new one, come for a few minutes or the whole two hours! Please bring your supplies with you. If you need supplies, Atelier offers an array of needles, yarn and even looms! Every Tuesday, Harvest Community Church partners with Compassion Planet in distributing food at our church between 4:30PM and 5:30PM. People can pick up groceries & household supplies for their family or another family in our community at this time. In this tough economy, we love to extend a message of hope though a very basic need. To use the Harvest Community Church Food Closet, you must be a resident of Placer County and provide proof of residency. Re-igniting Community through the 3rd Saturday Artwalk. Blue Line Arts, The Downtown Roseville Partnership and The City of Roseville are working with the community to provide regular, monthly art and music events in the downtown business district during the monthly art walk to promote art and artists, economic growth in the community, and increase community development. 3rd Saturday Art Walk is a non-profit organization run by local business owners with authorization and support from Roseville?s Downtown Merchants Association and the City of Roseville. The organization is dedicated to furthering local arts, music, and culture in Roseville for free. It is completely powered by volunteer supports from the local community. Blue Line Arts' mission is to bring an everlasting experience to art lovers and community members to the ever-evolving Downtown Roseville. If you're looking for a class that will get your hands dirty with clay, then stop looking - here is the class for you! Ceramics Open Studio is for people who want to create a project or just look and learn some new tricks and tips. We welcome anyone who is interested in learning the ways of ceramics. You will see and learn some wheel throwing, sculpture, handbulding and glazing. Hope to see you there! Non-Member - $35. Member - Free. Women's Empowerment Group is a women?s support group that addresses a variety of issues such as self-esteem, empowerment, self-care, assertiveness, dealing with stress, personal development and other topics important to group members. It is focused on developing a healthy lifestyle as well as developing a stronger support system within the group members. This is a group with weekly 1 hour meetings. The group is open to join at any time and cycles through a 12 week curriculum. A Christ centered recovery program for life issues and addictions. We use scripture to work God?s character into our lives. We all struggle with something - drugs, alcohol, anger, control, depression, low self-esteem and many other things. It is all welcome here. This is a place to come and let God have it all. You can find a new way to live without that stronghold that holds you back. Come and see what God can do for you! This Native American recovery program uses the strengths of Native culture, including traditional teachings and ceremonies, to build recovery skills and create a network of relapse prevention support. We are an all-volunteer group of parents, family and friends of Gay, Lesbian, Bisexual and Transgender, GLBT), people. Celebrating Diversity, we are: PFLAG Greater Placer County. We welcome you all to our meetings and membership. There is no cost to attend, and membership is optional. Gates open at 6:30 p.m. Concert starts at 7:30 p.m.